Vybz Kartel is suggesting that Mavado and Jahmiel are killing Alkaline’s career. 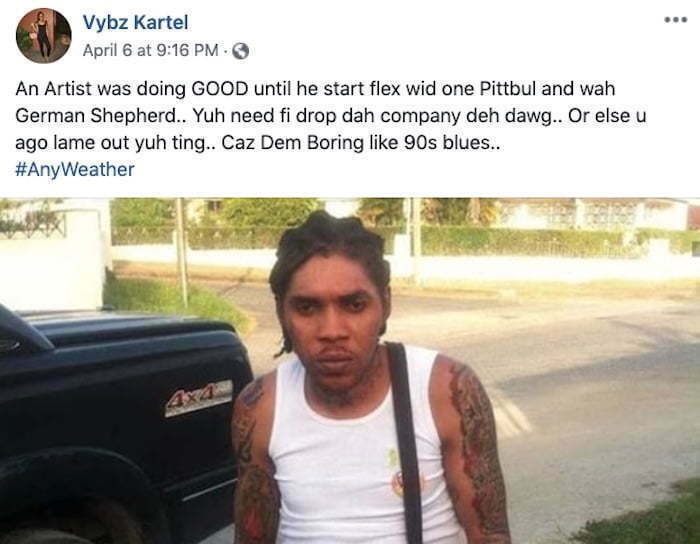 We haven’t been hearing much from Vybz Kartelon social media for the past few weeks due to his hiatus on Instagram, but he has been sounding off on Facebook over the past few days. In a new post on his official Facebook page, the Gazanation leader drops some subliminal shots on the MVP camp. Some fans think that he is telling Alkaline to leave the friendship of Mavado and Jahmiel, while other fans feel that he is telling Jahmiel to leave the MVP to better his career. “An Artist was doing GOOD until he start flex wid one Pittbul and wah German Shepherd.. Yuh need fi drop dah company deh dawg.. Or else u ago lame out yuh ting.. Caz Dem Boring like 90s blues. #AnyWeather,” Kartel wrote. “Any Weather” is the title of his new single which was released last month. For the past few years, Vybz Kartel and Alkaline have been the two front runners in dancehall, but later the Vendetta deejay has been getting some criticisms inside dancehall from folks who say he fell off because he started flexing around Mavado. Kartel is now waiting on the conclusion of his appeal case which aired in the Appeal Court last year July. The dancehall deejay is hoping the court will exonerate him which would pave the way for his release from prison.